It's tempting to suggest that no-one inside Goodison Park foresaw Chelsea's second-half capitulation - especially Evertonians waiting two years for a win over top-six opposition. But that would be disingenuous. For Mauricio Sarri and those Chelsea supporters watching in the away end, it was hideously familiar and painfully predictable. They have seen this in Wolverhampton. They witnessed it again in Manchester and now the Chelsea roadshow took the inexplicable trick of stripping a once title-winning team of its identity to a disbelieving Merseyside audience. A team that once demanded the most physically and mentally resilient performance of the season just to match, let alone defeat them, has been reduced to a group of psychologically suspect tippy-tappers. Everything Chelsea represented - mental strength, athleticism and that ability to stiffen their backs and plant their flag in the most hostile territory - has become a memory. The visitors' second-half performance was dismal, defensive timidity matching a blunt attack, further confirmation how far this side has declined since their Premier League win two years ago. They still have so much individual class but it cannot compensate for visible imbalance and a worrying collapse under the first strain of pressure. 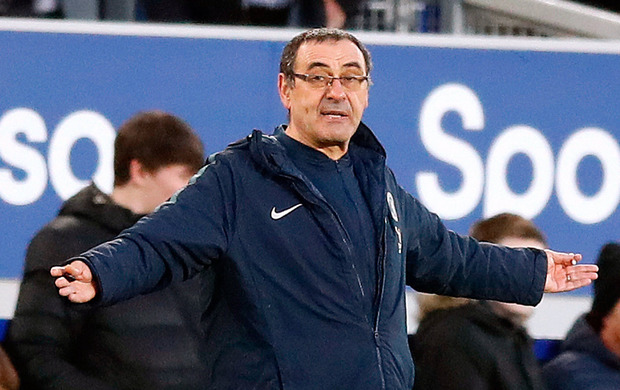 Not for the first this season, Sarri said it was a "mental" problem, suggesting the side was "playing to its limit" as it succumbed to defeat. "We played the best 45 minutes of the season," insisted the Italian. "And then in the beginning of the second half, we stopped playing. I do not know why. We did not defend." 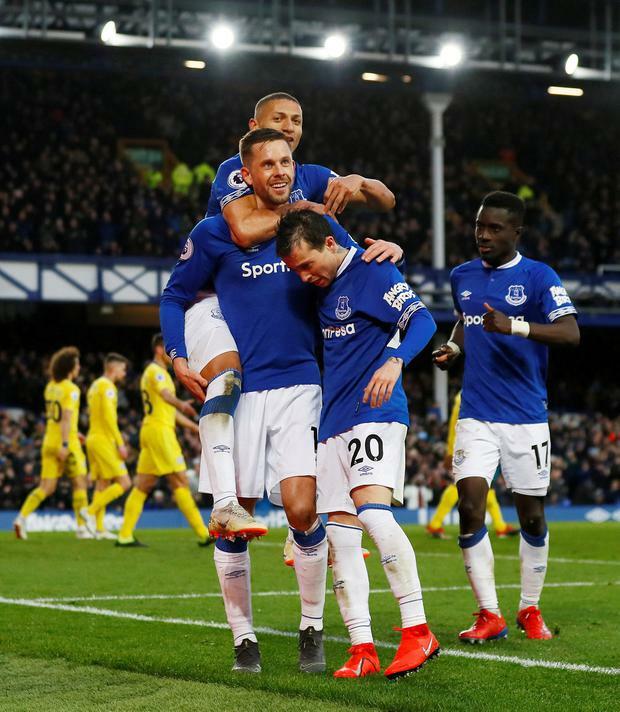 Everton's vast second-half improvement merited the victory, Richarlison's header providing the breakthrough before Gylfi Sigurdsson tapped home the rebound after seeing his 71st-minute penalty was saved. When Everton clicked, the way they exposed Chelsea's defensive frailties was impressive. David Luiz and Antonio Rudiger were especially appalling, having coasted through the first half. Midfield protection was non-existent, too, underlining why Sarri's problems extend further than the lack of clinical edge up front. And, yet, the visitors could have gone ahead on four occasions in the first seven minutes, Eden Hazard striking a post, Gonzalo Higuain's tame attempt cleared off the line by Michael Keane, with Pedro and Jorginho also going close. It looked only a matter of time before they broke through, but they faced a different proposition after the break. The great Chelsea sides were adept at mid-game problem solving, reacting to changing circumstances and noise volumes. The modern incarnation withers. The shift in momentum was fierce, Everton full of vigour, Chelsea unresponsive. 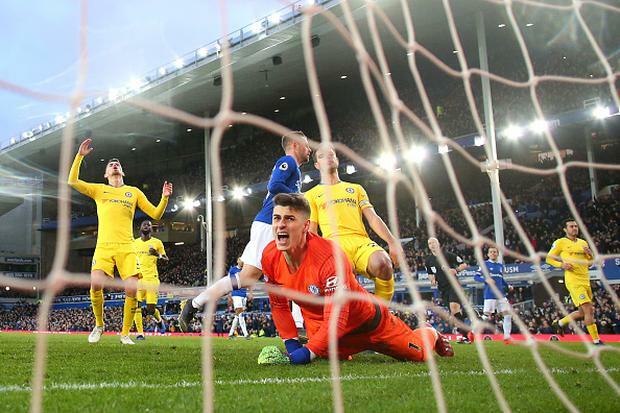 Goodison optimism flourished when Andre Gomes forced Kepa Arrizabalaga into a smart save a few seconds into the second half. Four minutes later, Everton led from a set-piece. Sigurdsson's corner found Dominic Calvert-Lewin and Arrizabalaga's block dropped to Richarlison, who headed in. The second came on 71 minutes when, after Marcos Alonso had tripped Richarlison, Sigurdsson was relieved to convert the rebound after his penalty was saved. For returning Goodison graduate Ross Barkley this was an especially forgettable homecoming, his every touch was jeered as he lasted 65 minutes before being replaced by Ruben Loftus-Cheek. "If you are talking about the first half we can (achieve) everything," said Sarri. "If we play like the second half in the next eight matches we are in big trouble."